If you did some research you will probably know by now that the aperture is one of the most important factors while choosing a brand new telescope. In this buying guide, we will focus on the best telescopes by aperture size: 6″, 8″, 10″, 12”, 14” and 16″ inch telescopes. Of course, there are other important elements like mount type, focal length and eyepieces that you need to have present in your analysis. But the aperture size should be the factor of determination. This will be directly impacted by the aperture size. A bigger 16″ inch scope will gather more light than a 6″ inch. So for a more professional telescope and the ability to see deeper celestial objects with a great image definition and light you should keep your choice from the 10″ section to bigger ones. When you go after bigger apertures there’ll be a direct impact it the scope size and weight. There are clever designs like the collapsible Dobsonian from Sky Watcher that helps with transportation but as a rule of thumb the more advance the telescope the bigger instrument you’ll have to handle. As you would imagine with a larger aperture the optics are more advanced so the result is a more refined instrument with quite a higher price tag. Although there can be exceptions that we will see later on, like a smaller telescope that comes with a better mount or computer Goto system making it more expensive. 6-Inch Telescope: Celestron NexStar Evolution Series 6"
Why Is the Aperture The Most Important Factor? Why is the Aperture Size the most important Factor? While most people focus on the magnification power of a Telescope. The true factor that will give us a high-quality image is the aperture. There’s no point of having a telescope with a lot of magnification but a poor and fuzzy image. When we use an instrument with a larger aperture the image will be brighter and this is what matters the most, even letting us magnify the image while maintaining the quality. This misconception also applies to the celestial objects you will be able to track with different aperture sizes. You will be able to see from Galaxies to Nebulae with apertures from 4” but what will differ is their apparent brightness. On a smaller aperture, the brightness is much lower than you will be able to see with a 16″ scope, impacting directly on the quality of the image. To fully understand the concept of resolving power of telescopes and the different aspects that make them different you can do some further reading on our telescope equipment guide. How to fine-tune your research? Before we start our list let’s go over some deductions that will make your research easier. When you are looking for a new scope it’s hard enough to decide which type and brand to go with. So establishing a budget that you are comfortable spending is critical. It will make your life so much easier. For example, if you have no problem spending a couple of thousand dollars then you have almost no limitations and you can focus on which type of technology to choose from. For instance, you can get a great optical telescope with a GoTo mount that will let you discover celestial objects without the need to manually point it. The computer with a motorized mount and a GPS system will take care of everything after an initial manual alignment. On the other hand if have only a few hundred dollars to spend you can also take advantage of cheaper telescopes without a computer system but with great 10″ inch aperture optics. Letting you track the same types of celestial objects. If you are planning to get serious on starting your astronomy journey then manually discovering a navigating a star map is a must. Are you planning to use the telescope constantly? Are you comfortable setting up and moving around a large and heavy Telescope? These types of questions should also lead you to a buying decision. If you are comfortable managing large scopes you’ll have no problem with wider apertures. But be sure you will enjoy the process! Without further ado let’s start the list of Telescopes per aperture size. We’ll start from smaller apertures all the way up to bigger scopes. 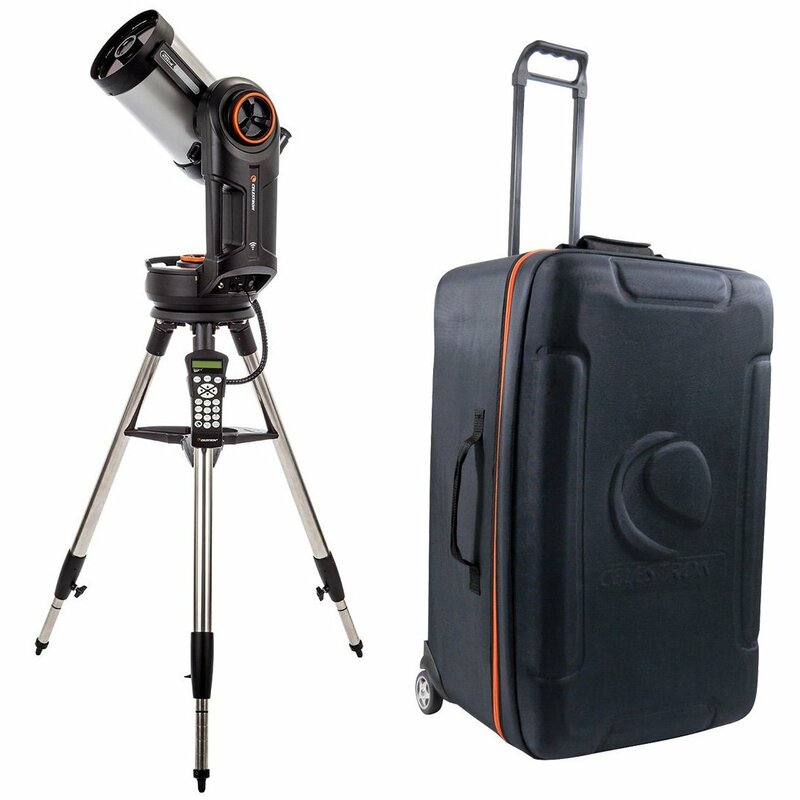 Celestron has a proven path, with excellent products aimed at beginners to advanced astronomers. With the NextStar Evolution Series, they managed to match great optics with some incredible technology. Being an automatic scope you will be able to control everything from your smartphone or tablet through the Celestron app. 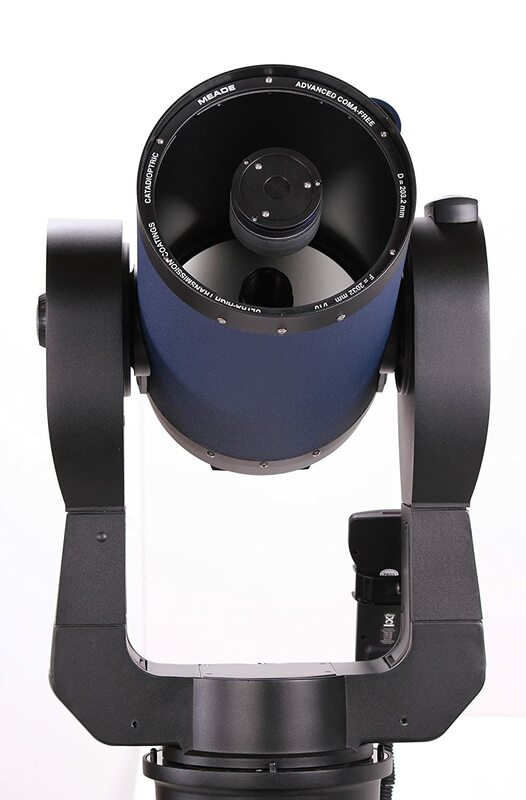 This Schmidt-Cassegrain telescope comes with a GoTo computerized mount that makes the tracking process a breeze after aligning with three sky objects. Thanks to it’s mount type and how well it tracks objects is a very interesting choice if you are intro Astrophotography. 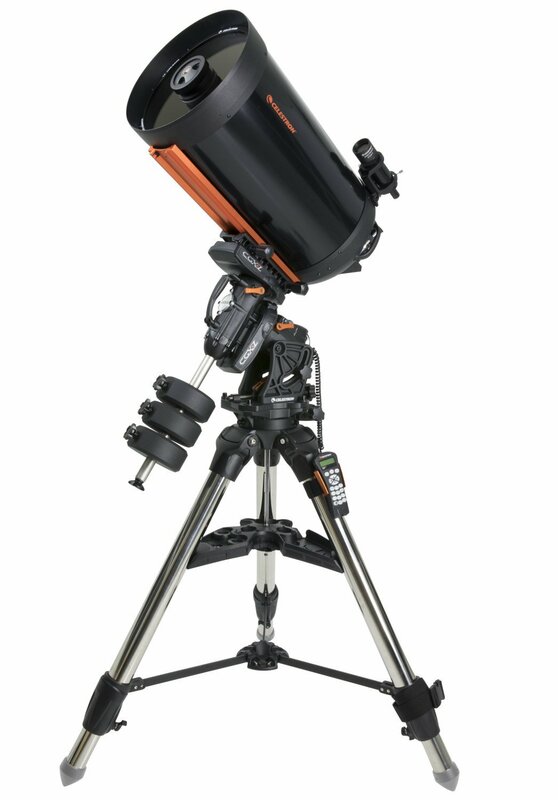 If you are looking for a more budget friendly option you can also check the Celestron 6SE. With an aperture of 6” inches, this is the smaller scope of the list, but the quality of the optics makes it a great option capable of delivering a high-quality image with not too much to envy from bigger telescopes. The NexStar Evolution Series 6 provides a 1500mm focal length or F/10 focal ratio. This telescope comes with GoTo Computerized Altitude-Azimuth mount and DC servo motors. The hand computer is really user-friendly and fun to operate making it ideal for new Astronomers that don’t know how to manually track objects in the night sky. This series also comes with Wifi letting us control the system through the Celestron Skyportal App, a great interactive experience. Another great advantage of this scope. Designed to set up everything in just minutes the size is perfect for travelling. It also comes with a travel case making it by far the easiest telescope to handle of this list. In the 8-inch category, we have the Meade LX200-ACF an incredible piece of equipment that gathers the most important features that a telescope needs to be perfect. The optics are outstanding with Ultra-High Transmission Coatings and comma-free making it capable of delivering high-quality images. This is also a GoTo telescope with motorized mount and a GPS that points the scope to any of the 147,000 objects in its Library. A perfect telescope choice to do some Astrophotography using different methods like the piggyback. With an aperture of 8” inches, this scope gathers a very reasonable amount of light. Paired with top-notch optics it’s a perfect choice for those starting out to advanced astronomers as well. 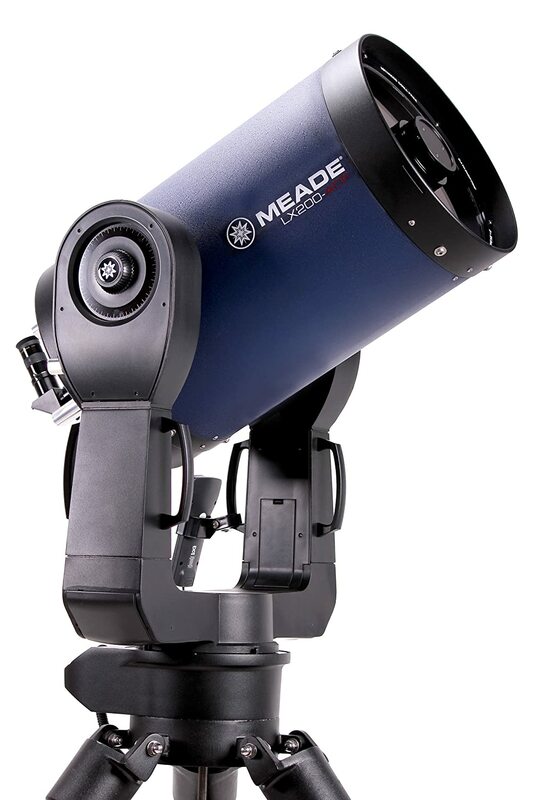 The Meade LX200-ACF provides a 2,000mm focal length or F/10 focal ratio. 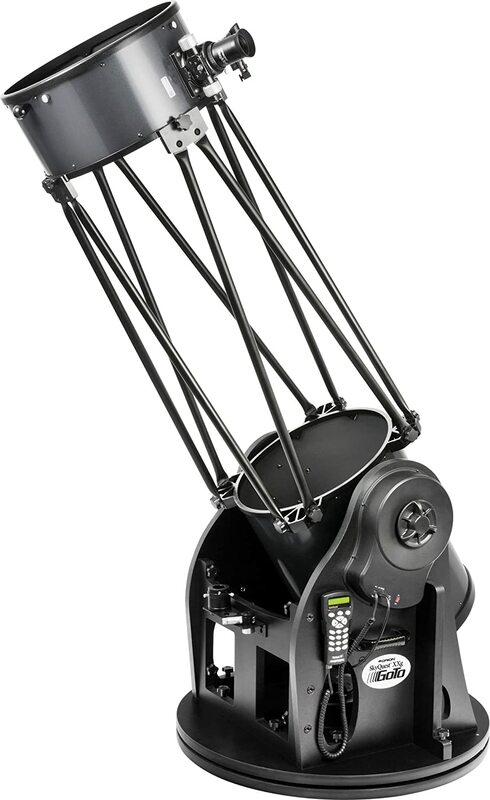 This telescope comes with LX200 AutoStar II computerized altaz with Go-To and dual-fork DC servo motors. The hand computer comes with an impressive database of 147000 Celestial objects but don’t expect the scope to be able to show you each one of them, it has some logical limitations. It also comes with an interesting guided tour that will automatically take you through different points of the night sky. With an 8″ inch aperture size, this is not a small Telescope yet is still designed to be handled by one person and easy to set up. A great sweet spot between a professional quality scope and a clever design that will make you want to use it constantly. Choosing a 10″ inch aperture scope is a great size where you can find very capable instruments and not needing to spend a fortune. It’s also a great capacity and size factor. These telescopes will not be small or compact yet they have a comfortable size to be able to travel with. This is the case for the Dobsonian reflector telescope Orion XT10G with a fully computerized GoTo Mount. A great telescope pack with a lot of features with a very competitive price tag. This telescope comes with a 10” inch aperture. Delivering a great definition image for faint sky objects like the Orion Nebula and the Andromeda Galaxy. The Orion 10135 SkyQuest XT10g provides a 1200mm Focal Length or F/4.7 Focal Ratio. This is a Dobsonian mount fully motorized with the GoTo system, letting you track everything automatically. The hand held computer tracks over 42000 celestial objects on its database and with a really easy to operate system. Great size to capability ratio. You can definitely travel around with this scope while enjoying the excellent viewing experience. It can easily be handled by one person. 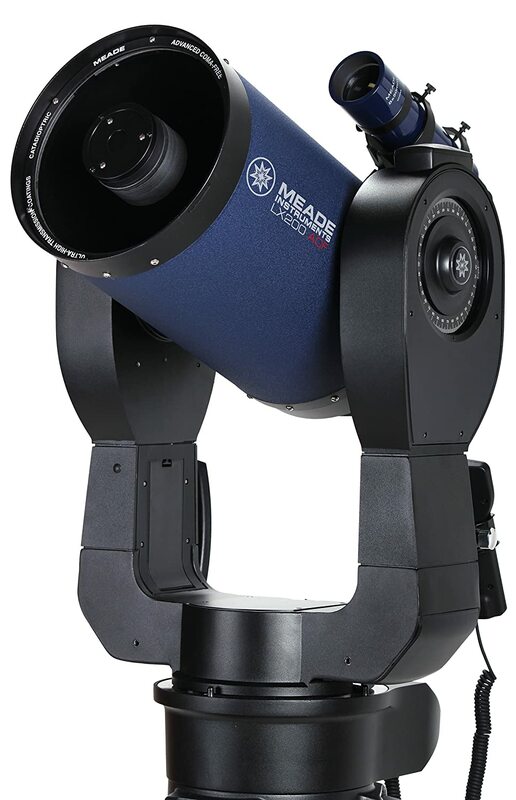 Entering the big boy’s section here comes Meade again with the Lx200-ACF 12” a beautiful precise instrument ideal for the more advanced Astronomers that will take advantage of its quality and features. From looking at the details of the moon to Star Clusters this scope does an amazing job with the combination of the comma free optics and the 12″ inch aperture that will let you gather a lot of light. This is a great upgrade from the 8″ inch version. Beautiful optics with 12″ inch aperture and advance Comma free with UTHC coatings. The Focal length of the LX200 is 3048mm, and F/10 focal ratio. 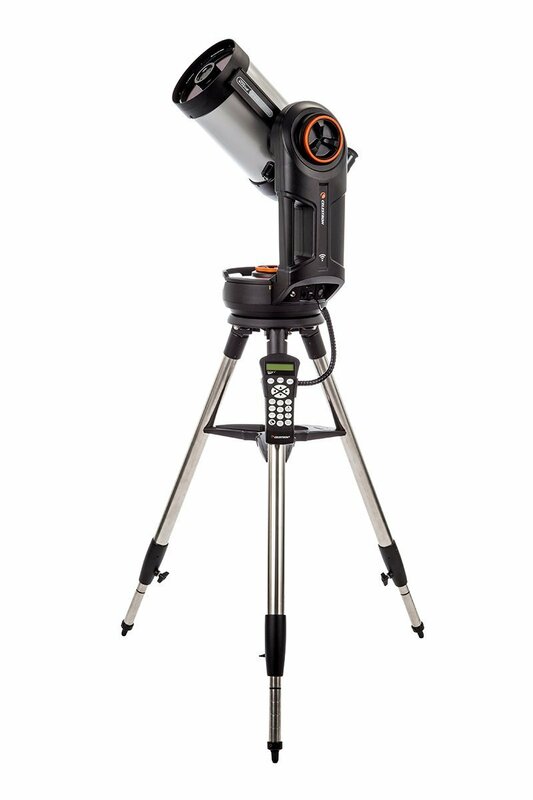 The Altazimuth smart mount with GoTo motorized system will let you browse the night sky with its automated computer. 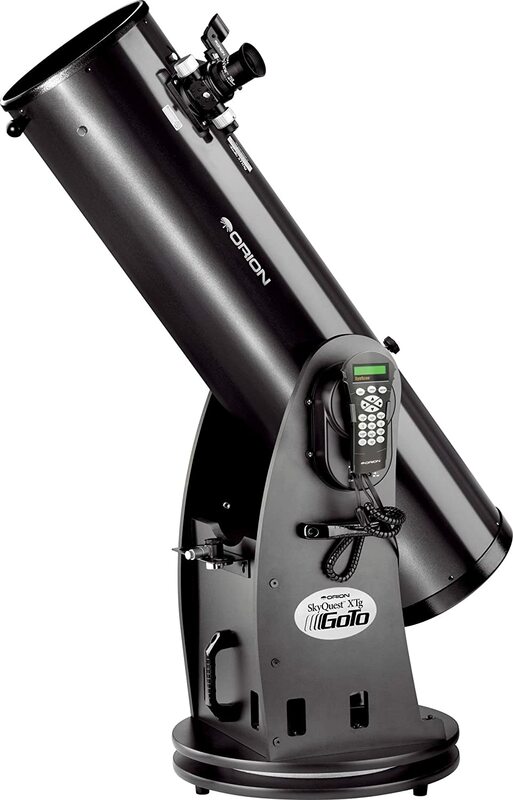 The hand held computer is user friendly and comes with an impressive database of 145000 celestial objects to point the scope automatically thanks to its AutoStar II GoTo System. A 12-inch telescope starts to be a bit heavy, weighing about 54KG. Although the Meade LX-200 series are cleverly designed the size and weight will start limiting us in the setting up process. There’s no doubt This scope screams quality from the tripod all the way to the optics. But this comes with a price tag. If you are limited in some kind of way you can go for a non-computerized option. This leaves you with a very capable instrument without the computer and GoTo mount. Our recommendation, in this case, is the Sky-Watcher Collapsible Dobsonian 12”inch Telescope. Celestron is know for its variety of products aiming from beginners to professional astronomers. In this case, they produced a Top Notch telescope that combined with its 14” inch aperture provides a perfect experience. Besides its professional optics and mount, this scope is packed with incredible technology. You can control the telescope remotely through an App a very interesting feature. With its tracking system and light gathering capacity the Celestron team designed the CGX-L 14”SCT with Astro imaging in mind. If you are into Astrophotography this is definitely the perfect pick. Big 14” inch aperture with premium StarBright XLT optical coatings makes this scope a really refined instrument. The Focal length of the CGX-L 14” is 3048mm, and F/10 focal ratio. The equatorial mount holds up to 75 lb of load capacity and comes with a computerized GoTo System for automatic tracking. An ideal system to use for Astrophotography. The hand held computer is really easy to use although it has a smaller database than de Meade scopes with 40000 celestial objects. The smaller database doesn’t mean is not packed with incredible technology like the ability to control the scope from a remote place through an mobile app. Once again this is a big tool but Celestron did a great job taking everything that is not fundamental yet maintaining a sturdy base. Setting up this scope is a fairly easy process. Finally we got the biggest aperture size of the list yet not the pricier. The Orion 8968 is a really interesting choice packed with all the important things a quality telescope needs (great optics, technology with autonomous tracking system, solid mount). This monster with a 16” inch aperture size offers the most value of the list thanks to its price point. Being a Dobsonian type telescope this is not a good choice if you are planning to use it for Astrophotography. That said, it’s capable to pull in faint nebulas with no problem, delivering a high-quality image with its quality optics. This scope has a really clever design for such a big instrument. Thanks to the design you can break down both the optical tube and the Dobsonian base, ending up with something that is actually portable. This is a great feature for a scope of this size and weight and will help a lot if you are planning to travel. Superb 16” inch aperture parabolic primary mirror, ideal for Deep-Sky viewing. Gathering 2.5x more times than a 10” inch and 4x more times than an 8” inch. The Focal length of the is 1800mm and F/4.4 focal ratio. This is a Dobsonian Mount with GoTo motorized system for easy automatic tracking. But you can also adjust the handles and move it manually if you wish. The handle held computer is really easy to set up with a quick 2-star alignment. It comes with a Database of 42000 celestial objects to track. And you can manually change position without the need of doing the re-alignment. Thanks to its clever collapsible design Orion manage to produce a scope that you can break down into smaller pieces so you can travel with it in a small car. This doesn’t mean its small and easy to set up you’ll need about 10 minutes to get it ready. But taking into account the aperture size and its capability, being able to travel with such an instrument is a great plus. For example, if you are planning to use it for Astrophotography, the Dobsonian Telescopes are not a good choice because they don’t account for the additional rotation axis of the earth to the fixed object. Are you planning to travel a lot with your telescope? Or you can see your self-leaving the scope, gathering dust because is to big to handle? Do you prefer a computerized system with a GoTo Mount so you can track celestial objects in an automated way or do you prefer going for a traditional telescope and learning how to track things manually and be able to use a star map? Remember, be sure to establish your budget and filter the options that are beyond your spending possibilities. At this point, you should be looking at a narrower buying decision. And you can go for the wider aperture possible. The best telescope you can choose will be the one that you are most comfortable with and will let you evolve in this incredible journey called Astronomy.